TO JUST ONE THING . . .
“Meet Fletcher Moon. Half-pint schoolboy and fully qualified private investigator. Since graduating online, he's solved all sorts of minor mysteries at home and at school. It was only a matter of time before things got serious. 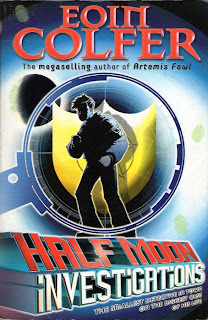 Half Moon Investigations is a book written by Eoin Colfer, the author of the best-selling Artemis Fowl series. This book is still, a stand alone but I believe that it is likely to have a sequel considering the contents of the book's epilogue. This is a mystery novel, can be categorised under juvenile fiction. Unlike the other books of Eoin Colfer, this is not fantasy and for a change, he hasn't even tried bringing in any supernatural element. Since this is a mystery novel, it won't be sensible to mention the protagonists and antagonists in the review. The main characters in this book are Fletcher Moon, Red Sharkey and the Devereux cousins (May and April). Fletcher Moon is a teenage (around twelve) investigator and is a qualified detective who is eligible to be a private detective in the United States as he successfully cleared the online tests set up by the legendary American detective, Bob Bernstein. Since he is a minor, he had to use his father's documents to take up the test and luckily, they share the same name. He is nicknamed “Half Moon” because he is short. Fletcher is a very formal person, his dress-code is different compared to his schoolmates, the way he speaks, his investigating procedures, etcetera. He is not physically strong or athletic. I think, Colfer has tried to make Fletcher a bit like Sherlock Holmes, trying to investigate every minute detail, trying to deduce everything from an empty piece of paper, etcetera. Although he is a qualified detective, he is only mocked by his classmates and not respected. Red Sharkey, is the son of the notorious criminal, Papa Sharkey and because of this background, he is the first suspect for any crime that happens. Unlike Fletcher, he is a very strong person, highly athletic and is also a very good singer. He is also not like his father, he is a bit more responsible and wanted his brother to stop following the footsteps of his father. The Devereux cousins (presumably, with a French descent) are popular, and are said to be pretty. April is a domineering person and she dominates her friends. May is the only one who defies April's orders and is also a dancer. The story is based in the Irish town, Lock and Fletcher narrates the story. The story starts with a mystery in school, over a petty crime and Fletcher solves it. The objective of the author is maybe to just introduce Fletcher to his readers. The main plot begins very late, when Fletcher has been attacked, very brutally, and he lands up in the hospital with his face completely swollen. Unfortunately, he lands himself into more trouble. In his hand, he saw the impression “RED”(reversed) and immediately accused Red of attacking him with his club since in Red's club, the letters RED were carved. The impression would go off soon and he needed a camera to show his evidence. He knew that May had a camera and her house was very near to the hospital but by the time he reached there, he May's garden was on fire and since he was the only person around, he was accused of being the arsonist. Now, Fletcher had two tasks as a detective, one, finding the one who had assaulted Fletcher and he had assumed that the same person had set fire on May's garden. His second task was to clear himself off the charges and hence, he had to work undercover because the police are looking for him. The story also has a sub-plot which is also quite interesting. I'd say that the ideal age for reading this book is between 8 – 14. Children in this age group may really find this book interesting but beyond that, people may find the plot to be too dull, even if not, suffers some logical flaws which an eight year old won't think of, such as, a twelve year old managing to deceive a “legendary” detective with his father's documents and getting himself certified, is not very logical (this is not the only one), but it is okay, for the ideal age group. The author managed to keep the book interesting nearly throughout the book and also managed to write a reasonably interesting sub-plot. The language, like any other Eoin Colfer book, has nothing special, but it is good, considering the fact that his target is not adults. I'd conclude by saying that this book is not great, but it certainly is good. I may have felt this because the people whom I knew had said that this is Eoin Colfer's worst book but fortunately, I read this after reading “The Wish List” and I found this to be far better. Another reason why I liked this book is because every Eoin Colfer book is very similar, just like an old wine in a new bottle and therefore, he has made a decent attempt to expand his horizon. I feel that this is a good book and hence I'm awarding this book a 6/10. “ MEG FINN IS IN TROUBLE. UNEARTHLY TROUBLE. Meg's soul is up for grabs as Heaven and Hell try every sneaky trick imaginable to claim it. Helping a lonely old man complete tasks on his wish list is her only chance. But even if she takes that chance, will she really have enough points to face up to St. Peter? The Wish List, is a novel written by the Irish author Eoin Colfer, who became famous after his success with Artemis Fowl. He writes fantasy and it is meant for children. Most of his books are categorised under “Young Fiction”. So far, this book is a stand alone and I don't think that there is going to be a sequel. 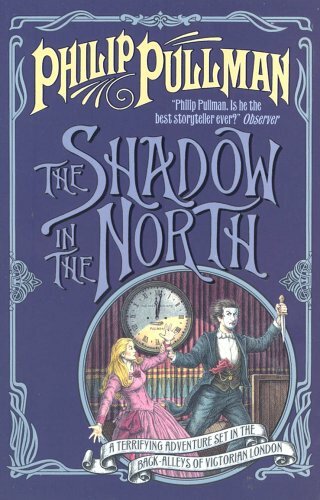 This book also falls into the usual Eoin Colfer categories,fantasy and juvenile fiction. This book also has occasional humour and doesn't have a sub-plot. This book will appeal to children aged 8 – 12. Meg Finn, is just twelve, but her mother is dead and her step-father is useless and she hates him. She has a friend, Belch Brennan, who is a petty criminal. She asked him for a favour and in turn, she had to help him in his little thefts. The other character in this book is Lowrie McCall, a pensioner, on whose house there was a burglary attempt by Meg and Belch. Kissy Sissy – Kiss Cicely Ward, a popular TV granny, who used to be Lowrie's lover, but he never managed to kiss her. Hence, he wanted to do it now. Kick a ball over the bar in Croke Park. Burst Ball – Brendan Ball has bullied Lowrie when they were in school. Now, Lowrie is seeking revenge and wanted to punch him on his face. Spit over the Cliffs of Moher. - Lowrie knew a rhyme where various tasks had been mentioned and he had accomplished all of them except this. Meg is not unopposed in this. The lord of hell sends Belch to stop Meg from helping Lowrie complete his Wish List. The story may not have has a good concept, but it certainly has a revolutionary concept. Afterlife was portrayed very differently in this book, it is also a place where things like computers exist. But for that, in my opinion, this book was terrible. There were several attempts made by the author to make this book interesting, where he mentions certain things, but forgets them after that and it just ends up becoming a loose end. Several things in this book had no logic, the wish list for example. Who would want to take revenge on a person after 40 years, just for bullying him in school. In fact, an old person would just be delighted to see an old schoolmate and of course, the other person also would not have any thoughts about bullying him at 60+. There was nothing special in the language. Despite that I'd say that it was good because the author's target is not adults, but children and considering that, he has written in simple English and occasionally, an elite word was used. This would also help them to improve their vocabulary and it is a better way of improving vocabulary instead of reading Charles Dickens' novels and referring the lexicon for every word. To conclude, this is not a good book or maybe it is my mistake to have read it when I was sixteen. Even otherwise, I don't think that the plot would appeal that much to a 11 year old. For its revolutionary concept and writing according to the target, I'd not be giving this book a 1 / 10, but a 3 / 10. 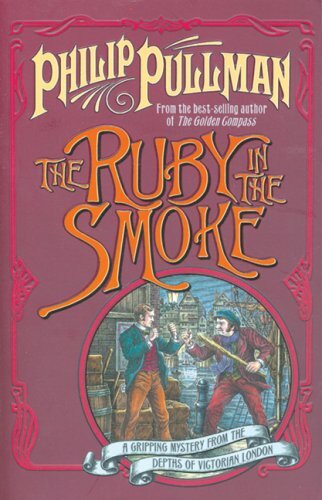 The Ruby in the Smoke is a book written by the author of the author of the His Dark Materials Trilogy, Philip Pullman. 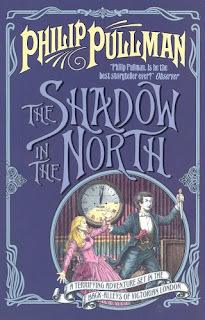 This is the first book of the Sally Lockhart series, whose sequels are The Shadow in the North, Tiger in the Well and The Tin Princess. This is a mystery novel and can be categorised under juvenile fiction. The main character in this book is Sally Lockhart. She is around 16, and is more like a girl of today, unlike a girl of her time(late 18th century). She is brave, is willing to handle things on her own, knows to use a pistol , accounting and some Hindustani. The other protagonists in this book are Frederick Garland and Jim Taylor. Frederick Garland is a photographer and is a part of his uncle's business. He is highly passionate about his work and doesn't care about the profits that he makes. Jim Taylor is an office boy in Sally's father's office. Jim Taylor is a also a brave person, a good fighter and has a very good vocabulary. The story happens in Victorian England, 1872 to be precise. Sally Lockhart's father, Captain Matthew Lockhart is dead. His ship had drowned in the East Indies. Sally's mother had died long ago, during the Sepoy mutiny in India, 1857. Sally is now an orphan, with no money and she is under the custody of an uncaring relative. Her father was in the army, and then, he had quit and started a partnership firm, with his friend Samuel Selby. Unfortunately, just before his expedition to the Far East, he had sold his partnership for 10,000 pounds and his lawyer doesn't know where the money is. There is a ruby, which the British Forces had obtained, during the Mutiny from the Maharajah of Agrapur and the Ruby rightfully belongs to Sally, but she doesn't know where it is and there are several clues. She is not alone in this quest, she also makes a couple of friends. She didn't want to live with her relative and approached Garland, who gave her a room and she became an accountant in his firm. But, she does have an opposition. There is a woman named Mrs. Holland, who is willing to do anything to get the ruby. She has spies everywhere and doesn't care about killing people in order to get the ruby. If Sally has to win this battle, she has to defeat Mrs. Holland, which is not going to be an easy task. The concept of this book is fantastic. It is not easy to write a story which happens in 1872 in the late 20th century. Along with the brilliant concept, the language, description of old London, characters, everything is just fantastic. The author has done a lot of research in the history of colonial Britain and has not made any factual error. The best thing about this book is it has only one theme, no digressions, no boring sub-plots, just 209 pages concentrating on this one theme. This is an excellent book. I'm willing to suggest this book to anyone. Even if no one asks for a suggestion, I myself may suggest this book to someone. This book was so interesting that a slow reader like me could complete it over two days, four hours to be precise. 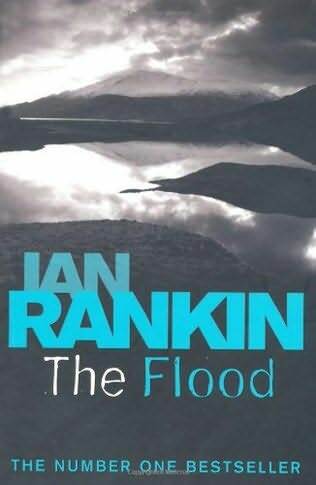 Considering its concept, language, description, story, there is no reason for me to deny a 9 / 10 for this book. “The incomparable Jack Higgins returns with a terrific new thriller, featuring his enigmatic hero Sean Dillon and a battle to defeat a Mafia don. It's all action and suspense as Sean Dillon and his secret intelligence colleagues seek to help American White House security insider Blake Johnson avenge the death of his ex-wife, a reporter murdered for getting too close to a Mafia story. In London, Beirut and Ireland, the daredevil friends are prepared to risk everything as they combine to thwart the ever more desperate ambition of Mafia frontman Jack Fox. But Fox has not become so powerful without learning a few tricks along the way. If Dillon and Johnson want to take him, they will have to face his personal brand of revenge. And it is a revenge every bit as deadly as their own. Day of Reckoning, is a book written by the British author, Jack Higgins and author who has written some best-selling books. This is Higgins' twenty-sixth novel and the eighth novel in the Sean Dillon series. According to the publisher, this book is supposedly a thriller, but I'd categorise this under the genre - “action”. It would appeal to people who like action movies. This book features Sean Dillon, an ex-IRA person, who disliked killing innocent people in Ulster and hence, left IRA and decided to be a mercenary, who sold his services to various organisations, legal or illegal, he didn't care. In his life of crime, he was caught only once, at Bosnia by the Serbs and was sentenced to death. Brigadier Charles Ferguson, who was directly under the British Prime Minister decided to take him out of prison and in turn, Sean Dillon had to work for him. Sean Dillon says that he is a good actor and is also a good scuba diver. He is a person who doesn't care whether he lives or dies and hence, is an ideal mercenary. The other main characters(protagonists) in this book are Blake Johnson, Charles Ferguson, Hannah Bernstein and Billy Salter and the only antagonist is Jack Fox, along with his aides.. Charles Ferguson is a Brigadier and he mainly wants to get his things done. He doesn't mind if his approach is unethical, for example, he doesn't mind hiring gangsters to take out gangsters. Hannah Bernstein is a Chief Superintendent in Scotland yard and she, on the other hand, gives respect to morals and values. She hesitates to do anything which is against the law and because of Sean Dillon's past, she is never willing t apologise him. Blake Johnson is an American, a friend of Dillon and Ferguson, is in charge of the President's personal force and is a close friend of the president and from what I could understand, for him, revenge is the priority. Billy Salter is petty criminal, nephew of an old fashioned criminal who runs a pub in London. Dillon hires him for his scuba diving abilities. Jack Fox, the main antagonist, is the frontman of the Solazzo family, a notorious mafia gang. He has a lot of illegal businesses and anyone who gets too close to him, is killed. Coming to the plot, it starts when Blake Johnson's ex-wife, Kate Johnson is killed by Jack Fox's mafia gang for investigating into the businesses of the Solazzo family. Blake Johnson, who comes to know of this wants revenge. He gets the details about the businesses of the Solazzo family from the tapes that she had recorded and he didn't want to take revenge by killing him directly. He wanted to ruin him by destroying every business of his (this was Dillon's idea) and making him run out of cash and thereby, because of his failures, the old don of the Solazzo family, Don Marco Solazzo would take Fox out of the business. Most of the story takes place in London, but to destroy the mafia's businesses, the story also goes to Manhattan, Ireland, Cornwall and Lebanon. So to describe the plot in one line, “Fox attacks, Johnson and friends plan the counter-attack”. The language of the author was good although, in one place, he had written, “She was always chronically short of money”. When you say, “chronic”, you need not even supply the adjective “always”. But for that, the language was very good. I also believe, if you're not sure of something, it is better not to use it. The research work was good, in most cases, but what I'm particularly referring to here is in this book, there is a surgeon named “Daz”, who is supposed to be an Indian, but I've never heard of such a surname. The first name was never mentioned so, I assumed that he was an Indian Christian but, he also mentions that he is a Hindu. I've never heard of the Indian Hindu surname “Daz”. One thing to be appreciated is the author didn't digress from the main aim of the story. But, if you ask me, the “Publisher's write-up” is misleading. “Fox's own brand of revenge” - Yes, Fox did start very strongly, but as the story went on, he nearly became a forgotten character and made a cameo appearance in the end. This book is not very boring, but there is nothing special in this. It may qualify for a Hollywood action movie and spending one and a half hours is not a problem but reading three 359 pages for such a book is certainly not worth it. It is as simple as this “Good fellows take out the bad fellows”. The appropriate age group for this book in my opinion is 15+. I would not suggest anyone to buy this book but I feel it can be read once, by borrowing it from a library or a friend. My rating – 4 / 10.